New 1800mAh battery extends the life of HTC Desire S by 24%. Designed to provide maximum mobile freedom, Mugen Power 1800mAh Lithium-Ion extended battery extends the life of the HTC Desire S by 24%! 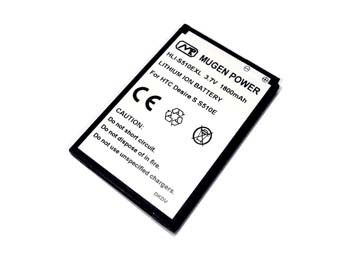 Mugen Power Batteries (http://www.mugen-power-batteries.com) the manufacturer of high-capacity batteries for handheld devices, today announces the new HLI-S510EXL Mugen Power 1800mAh Extended Battery for HTC Desire S which extends the time consumers can use this popular device. The battery is immediately available from Mugen Power Batteries with free shipping worldwide. NOTE FOR EDITORS: Mugen Power 1800mAh Extended Battery for HTC Desire S is available on request to editors of computer magazines and bloggers who will to write a review of the battery.